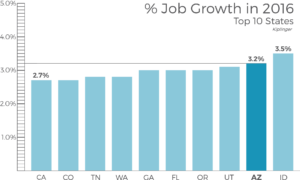 Most importantly, these ranking and statistics are accompanied by the arrival of more jobs for Arizonans. And Banner Health plans to spend $400-million dollar hospital expansion in Tucson (Arizona Republic 03/27/16). Add all of this to last year’s news that companies like Comcast (Arizona Republic 05/21/15) and HomeGoods (Arizona Daily Star 04/22/15) would collectively bring approximately 2,000 jobs to the area, and the evidence points to one conclusion – Tucson is among our state’s brightest rising stars. Outside of the two largest counties there is also good news. Just this month, Governor Ducey announced that Dot Foods, the nation’s first and largest food industry redistributor, will be taking steps to establish a new distribution center in Mohave County, Arizona. This facility will create 125 projected new Arizona jobs over a three-year period. Dot Foods plans to invest more than $45 million in infrastructure and various equipment. Find this brief online, here. Be the first to comment on "Governor’s Office: Arizona’s Economy Poised For Continued Growth"